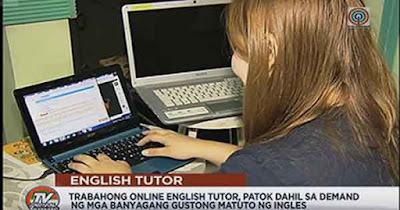 Online English Teaching is one of the trending and popular job today not only in the Philippines but in the whole world. This kind of work doesn’t need an institution or school where you will conduct teaching, your home can now be your workplace. For just like professional teachers who are teaching in an institution and accept a high range of salary, you can also be more like them. You can be more like them in the sense that you have many privileges and benefits to gain. If you have to work at home as online English Teacher, you have all the freedom. All that you need is a stable connection of internet and ideas about your lesson for you to have a good communication with your student abroad. Even if you are hired by an agency, you can be still the boss of yourself. You can decide whatever plans regarding your teaching works. You manage your own time, decides how many hours you will a lot of your work and can change your schedule whenever you want. That is a very cozy feeling. For those people who love to sleep long length of hours in the evening till morning, you don’t need to be worry and wake up early every day to work on time. Since you’re the manager of your time, you can wake up in your desired hour before your schedule. No dress code needed, just face in front of your computer, wearing a formal attire with a slipper and no heels needed. It’s a very comfortable way of working. If you ever taught in a school, there are many issues about discipline to face on. Maximum tolerance is really important for hard headed students and abundant lessons to prepare. But in online teaching, you don’t need to be exhausted and be bothered about those issues anymore because you have the complete concentration you wanted and the good aura or your workplace. One thing more, your benefits of being an online teacher is to have lesser work. It’s no longer necessary to make any lesson plan, check test exams and give grades. What just you need is the lesson you will teach in your every schedule of work. As a passionate teacher who really dedicates his life in teaching, you’ll be happy seeing the fruit of your efforts. Your student’s interest and willingness to learn in every part of your lesson has a big impact on you as their motivator. Of course, it will help you to lower your tension and in the end of your discussion, you will realize that you are a productive worker.